This workspace is intended for the resource manager roles, where the user will be able to review and act upon the items that are expected to be done in Microsoft Dynamics 365 for Finance and Operations. 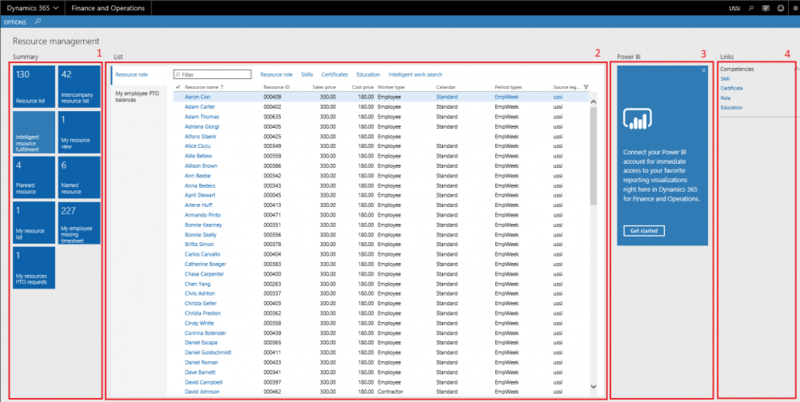 The resource management workspaces allow the resource managers to view all the inter-company and non-Inter-company planned resource and named resource line. and based on resource competencies, find a matching resource and map with project competencies to schedule them into the project resource plan budget. Users having the role of service industry super user, service industry view and resource manager role can access this workspace. Resource list Resource list displays a count of all the resources in the current legal entity, Resource manager can define a role and required competencies for a resource, so that it’s easy to match resources. Intercompany resource list Intercompany resource list displays a count of all the resources other than current legal entity, Resource manager can define a role and required competencies for a resource. My resource list My resource list displays the list of the records of resources for whom the logged in user is the approver. Resource managers can define a role and required competencies for the resources using this tile. My employee missing timesheet My employee missing timesheet displays the list of All missing timesheets and displays the records of employee’s timesheets for whom the logged in user is the timesheet approver. Intelligent resource fulfilment Resource manager can view and assign the resource onto the selected project line, after matching the skill set of the required role of the resource. My resource PTO request Resource manager can have access and view the Personal time off request for resource to whom the logged in user is the timesheet approver. Planned resource Planned resource displays the list of planned resource line which is assigned to project but there is no resource are assigned to the resource forecast line. Named resource Name resource form displays the booking of resources across projects. Resource managers will be able to view all the resources and the work assigned to them in this form. Resource role Resource role list page displays all the resources and It also has the sales price, cost price, worker type, calendar, period types, and source legal entity. Logged in user can open the resource list form clicking on hyper link of resource name field and define a role required competencies for the selected resource. My employee PTO balance List shows the PTO balances for the resources for whom the logged in user is defined as the approver. PTO balances displayed are as of a particular date mentioned as last column on the grid. Skill Opens the page of skills and display all skills list. Certificate Opens the page of certificate types and displays all certificate list. Role Opens the resource role page and display all resource list. Education Opens the education disciplines page and displays the all education list. These buttons are available on the selection of Resource role list page on the workspace and not on My employee PTO balances. Resource role Use this button to define the roles that you want resources to fill in projects for your legal entity. Resource roles are descriptions of the primary types of tasks that a resource can perform during the project. Skill Using this form, resource managers can assign the skill set to the resource. Certificate Using this form, resource managers can assign the certificate detail to the resource as required. Education Using this form, resource managers can assign and update education details of the resource. Intelligent work search The Intelligent work search form can be used for looking up work for the selected resource, resource manager can check required competencies match with the resource and assign the project to the respective resource.